Following continuous growth in the pair USD/CAD, the chart shows trend reversal. The pair had reached many-year highs of 1.2000, and started to decline. In general, this month has been favourable for the Canadian dollar. Constant negative US statistics caused strengthening in the CAD. In addition, last week data on Canadian labour market was above the forecast, providing additional support to the CAD. At the moment the pair is testing the level of 1.0970, which is the last obstacle before trend reversal. It is likely that the pair will experience correction to the level of 1.1030 and continue to decline. Resistance levels: 1.1030, 1.1080, 1.1120, 1.1160 and 1.2000. 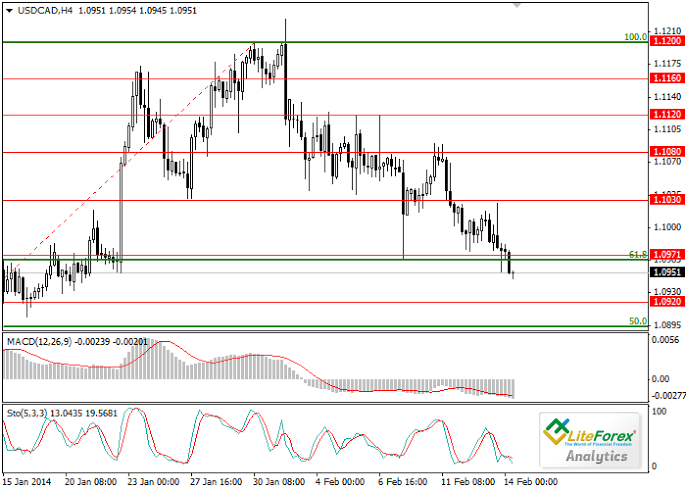 Consolidation below the level of 1.0970 will open the way to support levels of 1.0920, 1.0885 and 1.0850. Limit orders to sell can be placed at the level of 1.1030. Short positions are advisable after consolidation of the price below the level of 1.0950.